The Desert Remembers My Name: On Family and Writing (Camino del Sol ) (Paperback) | Eagle Harbor Book Co.
My parents always told me I was Mexican. I was Mexican because they were Mexican. This was sometimes modified to “Mexican American,” since I was born in California, and thus automatically a U.S. citizen. But, my parents said, this, too, was once part of Mexico. My father would say this with a sweeping gesture, taking in the smog, the beautiful mountains, the cars and houses and fast-food franchises. When he made that gesture, all was cleared away in my mind’s eye to leave the hazy impression of a better place. We were here when the white people came, the Spaniards, then the Americans. And we will be here when they go away, he would say, and it will be part of Mexico again. 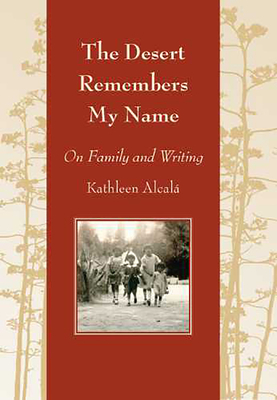 Thus begins a lyrical and entirely absorbing collection of personal essays by esteemed Chicana writer and gifted storyteller Kathleen Alcalá. Loosely linked by an exploration of the many meanings of “family,” these essays move in a broad arc from the stories and experiences of those close to her to those whom she wonders about, like Andrea Yates, a mother who drowned her children. In the process of digging and sifting, she is frequently surprised by what she unearths. Her family, she discovers, were Jewish refugees from the Spanish Inquisition who took on the trappings of Catholicism in order to survive. Although the essays are in many ways personal, they are also universal. When she examines her family history, she is encouraging us to inspect our own families, too. When she investigates a family secret, she is supporting our own search for meaning. And when she writes that being separated from our indigenous culture is “a form of illiteracy,” we know exactly what she means. After reading these essays, we find that we have discovered not only why Kathleen Alcalá is a writer but also why we appreciate her so much. She helps us to find ourselves.